Kamisori is a company which manufactures hair shears, using the finest materials which are available nowadays. As Kamisori says, no other company combines such diverse range of high quality metals with such unique craftsmanship. All of Kamisori hair shears are known as lightweight, ergonomic and perfectly balanced which ensure fast, precise and smooth hair cutting. During manufacturing process each pair of shears goes through 93 different steps to provide nothing but perfection. Kamisori produces several lines of hair shears – Dragon Line, Titanium Line, Damascus Line, Lefty, Shaving Razors, Accessories, Students, Specials, Pet Shears and HOTNESS Tools. These Kamisori Professional Hair Shears are made of V-10 cobalt steel and are coated with black titanium for superior durability, longevity, design and style. Usage of such hard and durable materials ensure hardness of 60 HRC. Both blades of these hair cutting shears have razor edges which provide razor-sharp, precise and smooth hair cutting. This Kamisori product is available in two different lengths – 5.5 and 6 inches, but their weight is 1.9 ounces. With their tension screw it is possible to adjust the cutting tension. Another feature of this product is finger rest which is removable so you can remove it if you do not need it, but actually it is recommended to use it because it helps to relieve the stress and discomfort from hands and shoulders during hair cutting. Unfortunately these hair scissors do not have finger inserts for finger holes, but it does not mean that they are uncomfortable and unstable, because they are not. 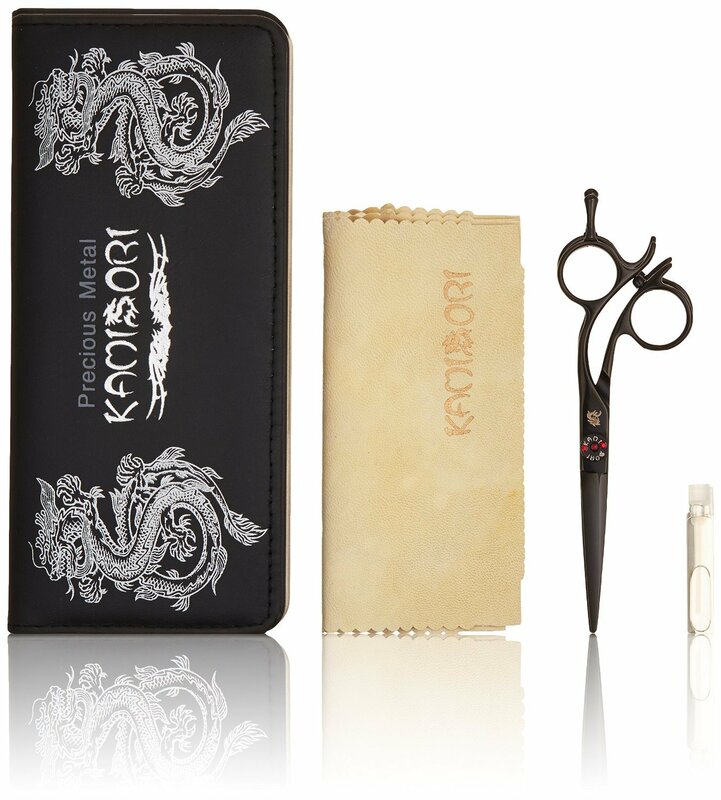 This Kamisori set includes not only hair cutting shears, but also synthetic leather storage case for safe and comfortable movement, cleaning / polishing cloth for constant cleanliness and sheen, as well as mini bottle of oil for lubrication of screw. It is very important that this Kamisori product has lifetime warranty and one year accidental damage warranty. As mentioned before, these Kamisori shears are coated with black titanium which not only improves durability and longevity, but also adds style. They feature asymmetric handle which is known as crane handle for better comfort and work ergonomics. Their tension screw is decorated with three little red diamonds which give elegant and subtle look, so tension screw becomes decorative. This Kamisori product is suitable for overall hair cutting – they have capability to cut both wet and dry hair and they can be used to perform slice, glide, point and blunt hair cutting techniques. All of Kamisori products are meant for professional use – they are specially made and equipped with advanced features, so they can be used by professional hairdressers. These Kamisori K2055 Professional Hair Shears are made of V-10 cobalt steel and are coated with black titanium, providing hardness of 60 HRC. They have razor edge hollow ground blades, asymmetric or, in other words, crane handle, adjustable tension screw with three red diamonds and removable finger rest. It should be mentioned, that they do not have finger inserts for finger holes. This Kamisori product comes with synthetic leather storage case, cleaning / polishing cloth and mini bottle of oil. They are available in two sizes – 5.5 inches and 6 inches, and their weight is 1.9 ounces. With these Kamisori hair shears every professional barber will be able to cut both wet and dry hair, using such cutting techniques as slice, glide, point and blunt. This Kamisori product has lifetime warranty and one year accidental damage warranty.